If your little girl like her toes colorful and she likes Princesses then you should check out this Disney Princess my beauty spa kit. The spa kit has everything you need to make your child’s nails look amazing just like a princess. 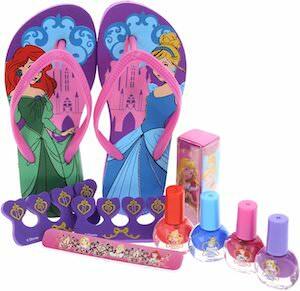 The set is for kids ages 3 and up and it includes flip flops, toe separators, 4 bottles of nail polish, and a nail file and all of it is Princess decorated. So now your girl can have Princess nails because of the non toxic Princess nail polish. The nail polish comes in 4 colors so that lots of nails can have different colors.